‘Fruit pretty large, roundish oblong, narrowest at the stalk, about three inches and a half long, and two inches and three quarters in diameter. Eye very small, with small, acute, closed segments of the calyx, placed in a shallow depression. Stalk three quarters of an inch long, rather thick, inserted in a small cavity; in some specimens it is diagonally inserted under a small elongated lip. Skin pale citron yellow, speckled throughout, more or less, with cinnamon russet, and tinged with orange brown on the sunny side. Flesh white, juicy, very buttery, and delicious. Ripe the end of September, and good for three or four weeks.’ [George Lindley – Orchard Guide p.386/1831]. ‘A very old and excellent Pear, which has so long been a favourite with cultivators, especially in France and Germany, that its names have become in themselves a catalogue. It is a great and certain bearer, ripening from the end of September till the third week in October; of first-rate quality as a juicy, melting sort. It is one of the very best to graft upon the Quince, and to cultivate en quenouille [pruned to a pyramidal, almost cylindrical shape]. It is almost to be doubted whether Miller really knew it, although he quotes it; since he calls it an indifferent fruit, which he would have scarcely done had he been acquainted with the true kind. During the time when it is in season, it yields to none in excellence.’ [PM t.60/1829]. Also figured in Le Jardin Fruitier du Muséum [JFM vol. 2/1859], Pomona Britannica [PB pl.LXXVIII/1812] and Saint-Hilaire [pl.32/1828]. 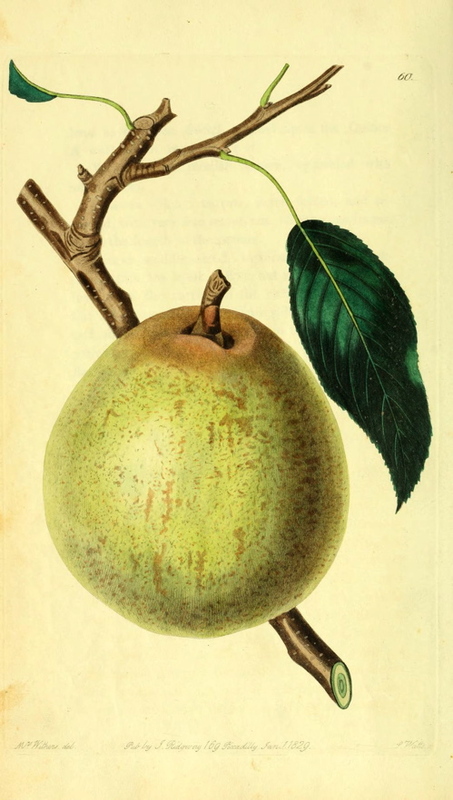 The pear figured in Pears of New York [p.230/1821] appears quite different to that figured in the Pomological Magazine and used as illustration here, more oval in shape and tinged bright orange. Listed in the 1850 and 1857 catalogues [Pear no.21/1850]. There is no diary entry for this pear.